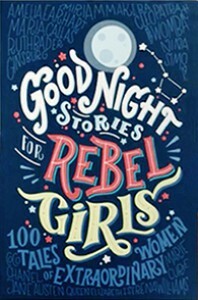 Goodnight Stories for Rebel Girls is a compilation of 100 bedtime stories of 100 extraordinary women from both the past and the present, and illistrated by 60 women worldwide. It is an amazing and inspiring book for all young people. This could be great for an individual reading books, and for students to do independent reading journaling about who inspires them and why. 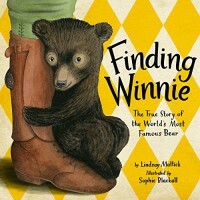 Finding Winnie: the True Story of the World’s Most Famous Bear by Lindsay Mattick is a level M on the Fountas and Pinnell reading level scale. Finding Winnie: the True Story of the World’s Most Famous Bear is about the bear behind the world famous Winnie the Pooh. A veterinarian who was going out to tend the horses decided to take in this cub and named her Winnie after his home town Winnipeg. The veterinarian took Winnie to war. This book tells the adventures Winnie had up until she ended up in the London Zoo and met a new friend named Christopher Robin. This is a great book to do during a shared reading lesson, and students could make predictions of what is going to happen during Winnie’s adventures. 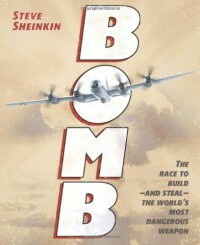 Bomb: the Race to Build and Steal the World’s Most Dangerous Weapon by Steve Sheinkin is a level Z on the Fountas and Pinnell reading level scale. Bomb: the Race to Build and Steal the World’s Most Dangerous Weapon is about the scientific discoveries of atom splitting, and the covert operations of enemy countries to steal it, and the work of the brilliant scientist hidden at Los Alamos. This is a great book to read while doing a history lesson of World War 2, and to teach students the damage that this weapon has caused and how dangerous it really is. 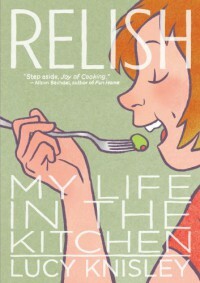 Relish: My Life in the Kitchen by Lucy Knisley is a level Z on the Fountas and Pinnell reading level scale. Relish: My Life in the Kitchen is about Lucy Knisley’s love for food. She is the daughter of a chef and the book talks about specific memories she had while growing up that started her love of food. I like that each chapter is bookended with recipes that are family recipes and things of her own creation. This book is great because you could make some of the recipes for students to try in class, and encourage students to start cooking with their parents or cook on their own with adult supervision. 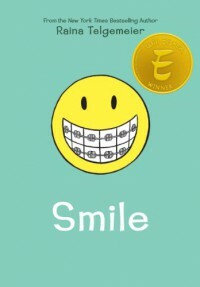 Smile by Raina Telgemeir is a level T on the Fountas and Pinnell reading level scale. Smile is about Raina Telgemeir’s story of when she was in 6th grade and got her front two teeth knocked out when she was running and tripped and fell. 6th grade is already a really hard time, but not having your front two teeth is really tough. This story shows her struggles as a preteen and getting through not having her front two teeth. This would be great to read to students who are going through a hard time and having issues of confidence as a preteen. You could also tell students to write in their journal of something they don’t feel confident about and how they manage to get through that everyday. 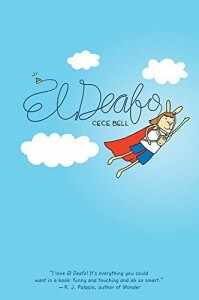 El Deafo by Cece Bell is a level X on the Fountas and Pinnell reading level scale. El Deafo is about a rabbit who is deaf and is going through struggles based on dealing with her difficulties. The story begins when she is four years old and is living a normal life, but when she contracts meningitis, the disease leaves her deaf. She has to start wearing a hearing aid and has to attend a special needs kindergarten class with other deaf students. When they move to Virginia, she is hoping to have a somewhat normal life, but has some issues with making friends. Then she has to get an even larger hearing device which makes her feel even more ostracized. To help boost her confidence, she creates a superhero named El Deafo who has super hearing. This helps her find a true friend in Martha, and gives her the courage to talk to her crush Mike who shows everyone in the neighborhood that her hearing aid is super cool. This book could be great to recommend to a student that has a hearing impairment. They can create their own superhero with a super power they wish they had and show them that they too have a “superpower” of their own. Pop! 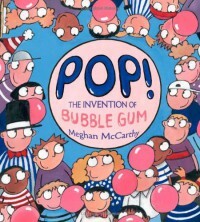 The Invention of Bubble Gum by Meghan McCarthy is a level 740L on the Lexile reading level scale. Pop! The Invention of Bubble Gum is about not only the invention of gum because that has been around for centuries, but the invention of the best gum ever, bubble gum. It all started with an accountant at Fleer Gum and Candy started to mess around with different recipes. Students will be so engaged by this book, and maybe you can use this in science to learn how bubble gum is made. If it's not too complicated, maybe you could create some bubble gum in class. 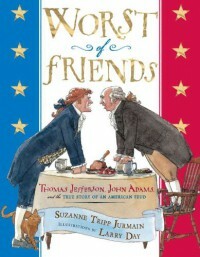 Worst of Friends: Thomas Jefferson, John Adams and the True Story of the American Feud by Larry Day and Suzanne Jurmain is a level S on the Fountas and Pinnell reading level scale. Worst of Friends: Thomas Jefferson, John Adams and the True Story of the American Feud is about two friends who had completely different views. Thomas Jefferson and John Adams disagreed so much about how to run the newly founded United States that they created two different political parties to run against each other in the elections. This book has a lot of history and humor, and ultimately shows a friendship that puts aside its difference to keep their friendship strong. This book would be wonderful for a history lesson to show that not everyone agreed on how this country should run, but it is good to have differences to make the best government and rules. Students could write about a time when they did not agree with a friend, and how they resolved the argument. 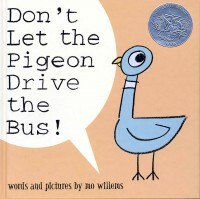 Don't Let the Pigeon Drive the Bus by Mo Willems is a level I on the Fountas and Pinnell reading level scale. In the beginning of Don't Let the Pigeon Drive the Bus!, the bus driver specifically says do not let the pigeon drive the bus, but the pigeon tries to trick you the whole time into letting him drive the bus. 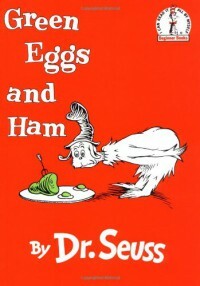 This is the cutest book of all time! What you could do in your classroom is tell the students to write a persuasive piece of why you should or should not let the pigeon drive the bus, and why. The Snowy Day is a level J on the Fountas and Pinnell reading level scale. 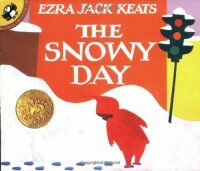 The Snowy Day is about a boy named Peter who realizes that it has snowed while we was sleeping. To celebrate, he puts on his red snow suit and goes outside to play. He runs into some challenges though, like being hit by a snowball by one of the older kids, but he makes it through and dreams that the sun came out and melted all the snow. When he wakes up he realizes that it snowed again, and relived his adventures like the day before. You could read this to your students a day after a snow day, and ask students to draw or write about what they did or would do in the snow. You could also ask students to describe what they would wear if it was snowing. Charlotte's Web by E.B. White is a level R on the Fountas and Pinnell reading level scale. 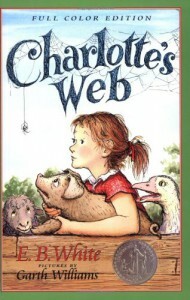 Charlotte's Web is about a pig named Wilbur who is the runt of the litter. He is saved by Fern and becomes Fern's pet. Wilbur is sent to Mr. Zuckermann's farm who is Fern's uncle, and Fern tries to visit as much as she can, but Wilbur is lonely. Until, he meets a spider named Charlotte. Wilbur finds out that in the winter he is going to be slaughtered for his meat, but Charlotte comes up with a plan to make Wilbur seem like a special pig. Charlotte starts spinning these words in her web to make Wilbur look like an amazing pig which saves him. Wilbur is put in the county fair because of the miraculous webs, and Charlotte comes along to keep spinning the words in her webs. While they are at the fair, Charlotte also spins a web for her eggs, and tells Wilbur that she will not be able to come back with him to the farm after the fair. She tells him to take care of her eggs, and he does so until they hatch and all of them but three leave. Those three keep Wilbur company during his long and happy life on the farm. This book is amazing for students lessons to teach them that they are all special in their own way. An activity you could do is tell students to create their own webs that have a characteristic that makes them special spun into the web. Matilda is a level S on the Fountas and Pinnell reading level scale. 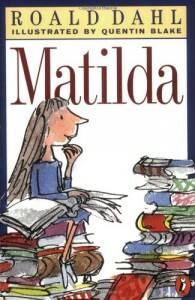 Matilda is about a young girl who has an incredible gift, her intelligence. She is the top of her class even though her parents don't support her, but she doesn't need their support because she has her teacher, Miss Honey, to show her her real potential. Matilda finds out that she is telekinetic by knocking over a glass with her mind when she was angry at the evil headmistress, Trunchbull. Once she finds out that Miss Honey had been taken advantage of by Trunchbull, Matilda comes up with a plan to get revenge. She writes on the chalkboard with a piece of chalk WITH HER MIND that if Trunchbull does not give back everything she took from Miss Honey or else. Which worked! Miss Honey got everything back and decided to move back home, but Matilda finds out that her terrible parents are moving to Spain, and she doesn't want to go. Therefore, Matilda moves in with Miss Honey and she lives happily ever after. 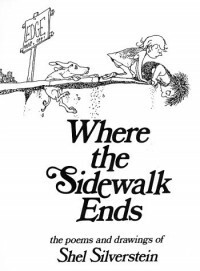 I think this a great book to read to your students and have them write about a time they stood up for a friend of their's that was not being treated right like how Matilda stood up for Miss Honey. They could also write about what kind of super power would they want. 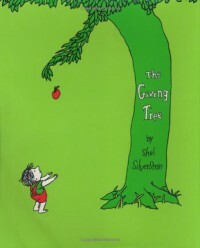 The Giving Tree by Shel Silverstein is a level N on the Fountas and Pinnell reading level scale. The Giving Tree is a book about a tree who loves this boy. The boy loves the tree too, and he loves to play with the tree. However, the boy starts to grow up, and he doesn't come around and play with the tree as much until he stopped coming around completely. The times the boy actually came around, the boy is upset and wants things that the tree can provide but it takes pieces of her as he takes them. The tree becomes more upset the more he takes, until one day the boy is old and comes to visit the tree. The tree tells him that she has nothing to give him anymore, but the old man says all I need is a place to rest. The tree becomes so excited because an old stump is great for resting, and she gives this to him. This book makes me cry almost every time i read it. The Giving Tree could be a great book to teach students that if someone gives you something you should be grateful because you know how it feels to give something you love to someone. I have also created a lesson plan where students could retell the story by doing a problem/solution activity. Students could also make predictions through out the story, and maybe even create a new story where the boy gave things to the tree in return. Because of Winn Dixie is a level R on the Fountas and Pinnell reading scale. 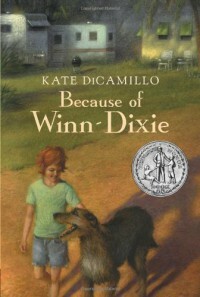 Because of Winn Dixie is about a girl named Opal who moves to a new town in Florida meets a stray dog rummaging through a Winn Dixie. They fell in love with each other, and Winn Dixie helps give her the confidence to meet new friends, until one day during a thunderstorm, Winn Dixie disappears. Opal has a heart to heart with her father that even though her mother left and Winn Dixie disappeared, she still has a father who loves her and many friends who love her too. Turns out though, Winn Dixie was hiding under the bed the whole time. This is a fantastic book to recommend to a student who loses a loved one, or a student who is new and moved to the school.